SUNRISE, Fla. - Florida Panthers President of Hockey Operations Dale Tallon announced today that the Panthers will be signing former captain Olli Jokinen to an honorary contract with the club and will officially announce his retirement from professional hockey as a member of the Florida Panthers. "Olli is an important player in the history of the Panthers franchise and he remains a fan favorite," said Tallon. "We are proud to give Olli the opportunity to retire as a Panther and we congratulate him on a long, successful and productive National Hockey League career." Thumbs up, or thumbs down to Maple Leaf Sports and Entertainment--it all depends on their willingness to heed my advice. I strongly suggest that MLSE would be wise to hire Olli Jokinen as a high-level media relations director, shortly after he decides to retire as an NHL player. At a time when the Toronto Maple Leafs seem incapable of making positive news, Jokinen delivers a Hallmark card full of compliments. The cynics will say he wasn't around long enough to know Jarvis Street from Front Street, but Jokinen raved about his time in Toronto as part of his return with the St. Louis Blues. "Everything is first class. Toronto is a great place to play. The hot tubs and the saunas and the meals are great. I don't know why free agents don't want to play for the Leafs," said Jokinen. The best treatment he got from the Leafs was ice time following a trade from Nashville that encouraged the Blues to deal for him and put him into the playoffs for only the second time in his career. So he's grateful, but the flowery praise was above and beyond the call of good manners. Jokinen played against the Leafs last night, and, if they're smart, he'll soon work for them. Olli Jokinen speaks with the Toronto media for the first time at practice on Monday. Mark Spector and Billy Jaffe of Sportsnet discuss possible options for Jokinen at the deadline. Olli Jokinen has heard the doubters and insists he’s not done. The Winnipeg Jets centre believes he still has plenty of gas left in the proverbial tank. A year ago, Jokinen was a big free-agent addition for the Jets, inking a two-year deal worth $9 million. The expectation was that he’d take over as the No. 1 centre but that plan never materialized. Winnipeg Jets forward Olli Jokinen is out 6-8 weeks with a high ankle sprain after colliding with New York Islanders defenceman Thomas Hickeyearly in Saturday's game. According to Gary Lawless of TSN Radio 1290, defenceman Zach Bogosian is also out at least a week with a concussion. The blueliner appeared to be injured after taking a hit to the head from Islanders forward Kyle Okposo. "We're right there, we have a lot of guys who have won in the past and have been in the post-season. But we also have some guys who have never been in the post-season. Still, most of the guys here have won or been in the playoffs at some level. They know how good it feels. We don't want to waste this year. We don't want to be saying in a couple of weeks we were close." - Olli Jokinen of the Winnipeg Jets and their playoff chances. More from Ed Tait of the Winnipeg Free Press. Hearing soon to be former #Flames Olli Jokinen and Winnipeg #Jets closing in on a multi year deal. Calgary, AB – Injury Update - Olli Jokinen underwent successful surgery on May 1st to repair a tear in an abdominal muscle. The surgery was performed by Dr. William Meyers at the Vincera Core Physicians Clinic in Philadelphia, Pennsylvania. Rehabilitation is expected to be three to four weeks and a full recovery is anticipated. Jokinen first reported discomfort on March 22nd when the team played the Minnesota Wild; he was examined by team physicians and was treated regularly by the Flames medical staff through the conclusion of the playing season; Jokinen opted to remain in the line-up during this time and no games were lost to injury. “I think it’s a mental mindset,” he said of his transformation from an offensive-minded but inconsistent scorer to a player who takes pride in shutting down the oppositions’ top lines and taking advantage of the scoring opportunities he does get. He says he now understands and accepts his role with the Flames, knows how he has to play, and prepares as if every game is his last in the NHL. With the help of a mental coach, Jokinen has become a creature of habit. “I have a guy I call every game day. We do imagery, we go over who we play against and usually try to focus on that night,” Jokinen said. Told that Olli Jokinen suspended for three games. As I posted earlier today, you can watch the hit at TSN. Phoenix Coyotes player Wojtek Wolski in NHL game #266 on November 17, 2010. Jokinen’s fine is based on his average annual salary and is calculated under the terms of the Collective Bargaining Agreement. The money goes to the Players’ Emergency Assistance Fund. The incident occurred at 10:32 of the third period and Jokinen was assessed a major penalty for cross checking and a game misconduct. Jokinen will miss the Flames next three games – Nov. 19 vs. Chicago, Nov. 21 at Detroit and Nov. 22 at New York Rangers. He is eligible to return Nov. 24 at New Jersey. Olli Jokinen could be facing a suspension. The Calgary Flames forward has an 11:30am disciplinary conference call with the league for his crosscheck to face of Phoenix Coyotes forward Wojtek Wolski in the third period of the Flames 3-1 loss on Wednesday night. The incident occurred in the third period of the game, and Jokinen was assessed a five-minute major and a game misconduct on the play. Scroll to the 50 second mark of this video at TSN to see the hit. While Bouwmeester gets the blame heaped upon him, he remains a pretty popular figure among the Panthers. Bouwmeester remains friends with a number of players and coach Pete DeBoer, who only had Bouwmeester for one season, continues to rave about his talents. —Jokinen, the Panthers former captain and the franchise’s all-time leading scorer, says he is hopeful the franchise is going in the right direction. As Olli goes, so will the team. Same goes for Sutter, who has tied his fate as GM to the 31-year-old Finn. If Jokinen can mesh with anyone on the top two lines — on Saturday, he opened between Tanguay and Iginla as expected — the Flames are likely to boost the offence to get them in the playoffs. If he continues to flounder, as he did last year before being traded, the Flames will miss the playoffs again, and Sutter will most likely be replaced by Jay Feaster. Arriving a few weeks early to register his kids in school, Jokinen appears fit and sports a good attitude. This is why it’s so much fun covering hockey in Calgary. When you ponder the history, under what circumstances could the Flames possibly ever consider bringing back Olli Jokinen? Consider that two years ago, Jokinen arrived in Calgary from Phoenix, costing them a first-round draft choice that the Coyotes turned into a blue-chip prospect (Moncton’s Brandon Gormley) at last Friday’s NHL entry draft. Jokinen to Calgary is all but done> 2 years, $ 3 mil per. A candid Olli Jokinen suggests Dion Phaneuf may have been railroaded out of Calgary because of the loathing of disgruntled Flames supporters. Speaking just minutes after he had made his New York Rangers home debut Thursday night, Jokinen strongly rejected the notion that Phaneuf was shipped to Toronto last Sunday because he was a cancer in the Flames dressing room. “No, no, no. Not at all. He’s a great teammate,” Jokinen said after the Rangers’ 6-5 loss to the Washington Capitals at Madison Square Garden. Okay, then why did general manager Darryl Sutter trade the young defenceman? “The biggest thing is, (Phaneuf) wasn’t accepted by the Calgary fans, even though he was once a Norris Trophy candidate,” Jokinen said. Dating back into last season, Jokinen has scored just once in his last 23 regular-season games – not enough for a player that averaged 37 goals in each of his final three years with the Florida Panthers and was acquired by Calgary at last year’s trade deadline to provide goals. Of course, the difference between Jokinen then and Jokinen now is evident in his shots-on-goal total. In those three years in Florida, Jokinen took 351, 351 and 341 shots respectively. Last year, split between Phoenix and Calgary, his shots plunged by more than 100 (to 236) and this year, it’s even worse. Through 10 games, he had only 17 shots in total, or about what Alex Ovechkin manages every two games. Every offseason, it seemed, brought more drama from changes in management and coaching, to star players being shipped out. Bouwmeester had seen enough. Bouwmeester, who is from nearby Edmonton, is back in his element. The players’ parking lot in Calgary has its share of fancy sports cars, but a good number of players share Bouwmeester’s style and drive Chevy or Ford trucks. Olli Jokinen isn’t one of those players. And unlike Bouwmeester, Jokinen didn’t want out of South Florida. Disappointed In- Sundin Or Jokinen? from TSN, Every week, the NHL on TSN panel voices its opinions on the hot topics of the day in the Wednesday Night Hockey Quiz. Among the big late season acquisitions, who has been the biggest disappointment Mats Sundin or Olli Jokinen? Bob McKenzie: I’ll go with Mats Sundin, only because his body of work with the Vancouver Canucks is larger than that of Olli Jokinen with the Calgary Flames. Having said that, I believe that the prospect of Mats Sundin reversing what has happened in the regular season and making noise in the playoffs is far greater than Jokinen with the Flames. Keith Jones: For me it is Olli Jokinen and for this reason: he shoots the puck a lot; therefore Mike Cammalleri has stopped scoring goals. Since the trade deadline just three goals for Cammalleri due to the negative effect of Olli Jokinen. When Olli Jokinen was traded to the Coyotes at the NHL Draft last year, the Coyotes felt they had that big, strong, offensive-minded centerman they had been craving. It didn’t work, for whatever reason. There was chemistry that was missing. The big Finnish centerman was trying, but it just wasn’t working. He has another season at $5.5 million, so the assumption is trading him to Calgary was a salary dump…. he issue was chemistry. This is not Shane Doan’s fault, although he is such a stand-up guy, he will try to take the blame. Everyone was searching for the right combination on the ice. Wayne Gretzky tried every forward with him…. So, at the end of the day, watch the Coyotes play. Don’t just read someone’s written opinion and buy into the money and the selling of players. Evaluate their game and team speed and skill level. All players, trainers and fans forge relationships with players and it is never easy seeing guys go. But make your own evaluation and then tell me this is a “sell-off.” You won’t see it that way. Any team more or less makes a covenant with its fans to do the absolute best it can. In the case of the fans, they have shown incredible devotion and dedication to the Minnesota Wild selling out every home game in team history up to this point. The fans have made its merchandise amongst the top selling teams in the league, and have filled the arena to over 100% capacity for the last few seasons. That covenant is a trust between fans and ownership. The actions or in this case the inaction of this team is a huge betrayal of that trust. With the team’s fortunes this season clearly heading south, the Wild opted not to be a big seller and chose not to trade soon-to-be unrestricted free agents Stephane Veilleux, Martin Skoula, Marc-Andre Bergeron, Kurtis Foster, or star winger Marian Gaborik. It seems strange a team that will likely not qualify for the post season did not even attempt to trade off assets with the hope of acquiring picks or prospects for the future. While the Wild won’t confirm what “major deal” it was involved in until Wednesday morning, sources say General Manager Doug Risebrough continued his longtime quest for Jokinen, the former Florida Panthers captain who was ultimately traded from Phoenix to the Calgary Flames. It’s put-up or shut-up time for Olli Jokinen. After years of teasing and flirting with becoming a truly elite player, rather than just a solitary figure trapped in unhappy situations, Wednesday’s trade to the Flames gives him every opportunity to finally fulfil his vast potential. His lack of leadership in the past has come into question. Well, he isn’t obliged to be a centrepiece in Calgary. No one’s looking for him to lead the charge into Joe Louis or The Shark Tank. There’s already many strong personalities inside the Flames’ room. Jarome Iginla and Robyn Regehr, for starters. There’s plenty of insulation for him to just go out and dominate on the ice - and certainly all the ingredients are in place for that. 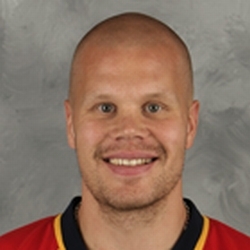 According to Bob McKenzie on TSN, Calgary and Phoenix are seriously negotiating a deal involving Olli Jokinen. McKenzie feels it’s likely a deal will be forthcoming. We’ll update with developments and links as they become available. Hradek (12:15 p.m. ET): A good source with knowledge of the dealings says the Flames-Coyotes are close to a deal on Jokinen. The source says the proposed deal would send Flames C Matt Lombardi and first-round pick to the Coyotes for Jokinen. Stay tuned! added 12:40pm, Darren Dreger calling the deal done. Brandon Prust, Matthew Lombardi and a first round pick to Phoenix for Jokinen. Update 12:44pm ET: Confirmation link at TSN. The iron-man streak of Olli Jokinen’s is over after 397 games. The Coyotes center, who had played 376 in a row in Florida before being traded to the Coyotes in the off-season, suffered a shoulder injury in Wednesday night’s victory at Columbus and will miss two to four weeks, starting with Friday’s game against Colorado. Q: Do you feel you were under appreciated while with the Panthers? A: “Yeah, but it is part of the business. They had to do everything possible to sell their season tickets. I was there to take the blame. I have no regrets. “I knew after the year I was gone, but probably the most disappointing thing was I didn’t really get a clear answer. I just heard everything, what was going on, behind the scenes. But I knew I was gone. I just didn’t know where…. Q: Have you been able to get past the incident involving your skate and Richard Zednik’s skate? A: “I’m just happy to see him playing again. It’s behind now. It’s past. I still wish all the best for the Panthers. I had a good seven years over there. There is a rather delicious irony in the fact the Phoenix Coyotes are scheduled to host the Florida Panthers Saturday night. Barring an injury, Olli Jokinen of the Coyotes will play his 735th career game that night against his former team. That appearance will eclipse the all-time dubious NHL record, currently held by former Panthers assistant coach Guy Charron, for most NHL career games played without appearing in a playoff game. Charron wasn’t aware of the impending history when contacted by The Hockey News Wednesday morning and it’s clear it’s an aspect of his playing career he has grown weary of discussing. Now Shane Doan and Olli Jokinen, unexpectedly thrown together as linemates in a blockbuster deal this summer, hope to use their skills - and unleash years of pent-up frustration - to get the Coyotes into the playoffs for the first time since 2002. To accomplish that task, both will have to be offensive powerhouses. A trip to the postseason also would do a lot to take the 800-pound hockey puck off their backs. Here are two of their numbers: Jokinen, 723 games played and no playoff appearances; Doan, 396 since his last blip on the playoff radar in 2002. More than 1,000 games to look back on, a lot of “what-if” scenarios, but this newest and biggest version of the desert’s Dynamic Duo has its sights set on making this a season to remember. “I don’t have any personal goal,” he said. “I think if I bring my best every night, do my best, the numbers are gonna be there. The bottom line is to win and help this team to win hockey games. The word was out about Olli Jokinen. And it wasn’t good. Olli Jokinen: I’ve been told my multiple league and team sources that the Wild is indeed very much interested in the Florida Panthers’ captain, who’s scored 173 goals the past five years. Right now, however, the price is not right. The Panthers wants a young, up and coming prospect from the Wild, and Risebrough is not willing to part with him. If that specific part of the package changes, the Wild would pull the trigger. And now with the Panthers guaranteed to miss the playoffs for the seventh straight season, Jokinen knows that when he does make it, if ever, he will have waited longer than anyone in NHL history. Panthers assistant coach Guy Charron, who played for four franchises during his 12 NHL seasons (1969-1981), is No. 1 all-time in most NHL games played (734) without a playoff game, according to the Elias Sports Bureau…. It has become quite clear in recent days that Jacques Martin and Olli Jokinen can’t co-exist beyond this season. One of them will be gone this summer, so now owner Alan Cohen has a tough decision to make. —- He can’t have Martin step down has coach and remain as GM because the GM picks his coach and he’d likely pick someone with a personality similar to his, one that players both in Ottawa and Florida contend doesn’t relate well to them. —- He either has to keep Martin in both positions or in neither. Questions about Jokinen’s leadership have surfaced, with coach and general manager Jacques Martin deflecting comment about that Thursday, saying it was something best addressed after the season. ‘‘I look back over the past 19 games and he hasn’t scored even strength,’’ Martin said. Olli Jokinen, the captain, the leading scorer, the name most associated with Panthers hockey, understands the stakes for his team because he agrees this is the ‘‘biggest game,’’ of the season. But he also has to have a clear understanding of what this means to him. Personally. And that is this: He must keep the Panthers winning and pointed toward the playoffs, because if he doesn’t his reputation as a guy who can’t get his team in the postseason will only mushroom. ‘‘Every year you feel like a failure if the team doesn’t make the playoffs,’’ Jokinen said Wednesday. ``All the goals and points—that’s all stuff you want to put away. If the team doesn’t make the playoffs, it’s a failure. Could this team unearth a top player from another team, whether it be a center or a defenseman – maybe a gritty, high-scoring center like Florida’s Olli Jokinen? After all, a fourth Florida scout watched the Wild play tonight for the fifth time in six games. Like I said a few days ago, I know the Panthers and Wild play this week, but wouldn’t you agree that’s a little excessive pre-scouting? Of course, I can promise you the Panthers wouldn’t just give Jokinen away. It would have to be a deal that knocks their socks off. They’re under no pressure to trade him — he’s under contract for the next two years at a reasonable price. With his team reeling, Panthers coach Jacques Martin indicated Friday he wants leading scorer Olli Jokinen to raise his game. The Minnesota Wild hasn’t tried to hide its interest in Jokinen. And it appears the Panthers are at the very least exploring the idea of trading him there by Tuesday’s 3 p.m. deadline. Panthers director of pro scouting Bill O’Flaherty was at the Wild’s game in Chicago last night. He’s the third different Panthers’ representative to attend a Wild game recently—pro scout Jack Birch and director of player development Duane Sutter are the others—and combined, the trio as attended four of the last six Wild games overall. Perhaps the Panthers want to be very prepared for their Feb. 29 home game against the Wild. Or…....they’re checking out their options for Jokinen. The cut left Zednik with a gash nearly two inches long—and Jokinen with an emotional scar. BUFFALO, N.Y. – Richard and Jessica Zednik today released a statement through Buffalo General Hospital.